July saw the inaugural Isosceles 5-a-side World Cup tournament which included Design Inc’s very own team including Paul Munday (Captain – Creative Director), Daniel Gilbert (Forward – Managing Director), Jon Turner (Forward – Studio Manager) & Darren Scurville (Goal Keeper – Account Manager). The event, which was held in West London, had all the ingredients of the real thing, great football, controversy, penalties and even a Frank Lampard moment where new goal-line technology was used – well ok one of the spectators on the sideline. The teams consisted of either clients, suppliers and friends of Isosceles Finance Limited which included Celona, Emergent, InsightSoftware.com, Solsis, Line and Design Inc. The group stages the matches were extremely tight; games were pinched by the odd goal here and there. This was demonstrated by the fact that the 3rd/ 4th and 5th /6th play offs all went to penalties! After all of the huffing and puffing, the pump and the grind of the group and playoff stages there were two left standing – Design Inc & Isosceles. This is somewhat of a Germany v England fixture, close neighbours who know each other’s players well. 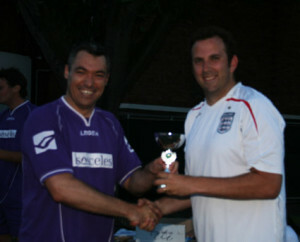 The final turned out to be more one sided than many had predicted and Design Inc were worthy winners. Jon Turner assured the assembled press that they would accept the cup in a spirit of friendship and humility and that they would keep this low key, they would be unlikely to brag, wave the cup around and generally remind Isosceles of their ignominious failure on a daily basis henceforth. Many congratulations to all the teams that participated, and a big thank you to Mike and the team at Isosceles for making it such a thoroughly successful event.